Choosing a mattress is not easy. Of all the Beloit, Wisconsin mattress stores and mattress manufacturers out there, it’s hard to tell which one will provide a quality product that will give you a great night’s sleep. If you want to get deep, rejuvenating rest night after night, you need to know some answers before you begin mattress shopping. 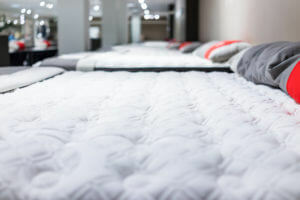 Here is a rundown of your choices in and around all the mattress stores in Beloit. We’re fortunate to have several options for furniture in our area, but some have more advantages than others when it comes to buying a mattress. Mattress Firm is a major national retailer of mattresses with 1,600 total locations including their Beloit, Wisconsin mattress store. However while that size and success might sound like an asset, it’s just the opposite when it comes to mattress buying. Since the company is so big, you can expect a hefty price markup, an uninformed sales staff, and a general disregard if you ever need service down the road. With so much business to their credit, they don’t need to try very hard to keep yours. There are several furniture stores and mattress stores in Beloit that sell mattresses including Best Buy Furniture Shop and Wahl’s Appliance and Mattress. It can be convenient to visit one of these emporiums if you need to buy other things along with your new bed, but since mattresses are not their speciality, you may end up with a lower quality product. Furniture stores typically have a limited selection compared to a dedicated mattress store, and their staff doesn’t know as much when it comes to choosing a mattress. You may find yourself with a beautiful new bedroom, but sleeping on a not-so-comfortable bed. 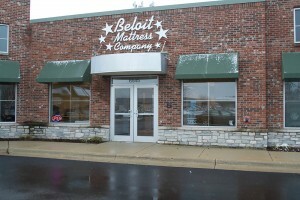 Beloit Mattress is a family-owned business that has been operating in the area for more than 80 years. All of the mattress in the inventory are made on-site, by hand, by master mattress craftsman. As a wholesale mattress manufacturer, there is no markup that gets passed on to you, and you get service from a family of mattress experts who knows about mattress materials, mattress sizes, and what it takes to sleep comfortably. With locations in Beloit and Rockford along with quality products online, a stress-free mattress shopping experience is easier than you think. At Beloit Mattress, we stand behind our products because we truly believe that we are the area’s best source for mattresses. We offer a 60-night comfort guarantee for peace of mind that you’ll be just as satisfied with your purchase as our faithful repeat customers. At Beloit, you’ll find handmade mattresses, no middle-man, and experts you can trust — everything you need in a mattress company. Ready to get quality sleep with a Beloit mattress? Here’s a 5% off coupon!